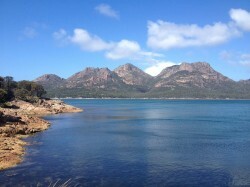 Before arriving at Freycinet, we had a few leisurely days, which was just as well as I had a few health problems. On one of my better days, we had lunch at Steward’s Bay Resort. This was an amazing place, tucked away off the main road and if you were not wanting camping or caravan accomodation, it would be a fabulous place to stay. 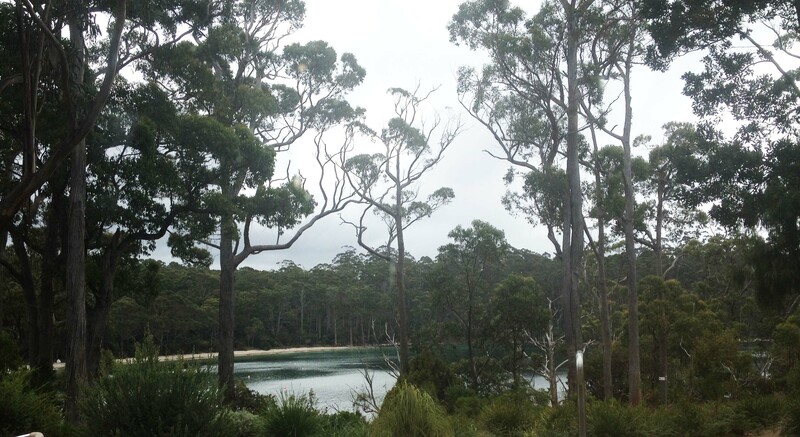 The setting was beautiful, with individual self contained units, a private beach and boat trips to Wineglass Bay and other places. This photo is the view from our table at the restaurant. We had Crumbed Blue Eye, with chips and salad and when the waiter placed our order with the kitchen, he just called out “the usual”! 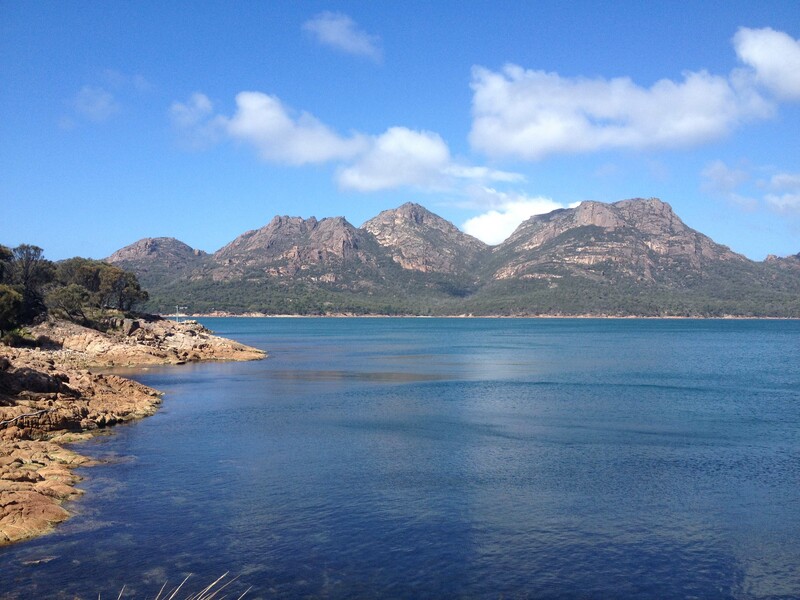 We are now staying at Freycinet National Park – in my opinion, the most spectacularly scenic place in the world. We were here three years ago and it is just as good as I remembered it to be. Coles Bay has a licensed cafe, general store, two small supermarkets, post office etc., and the bay is surrounded by three rugged mountains. It is an absolute tourist hotspot and bookings are essential. The National Park sites have water, electricity and drainage, with flushing toilets. 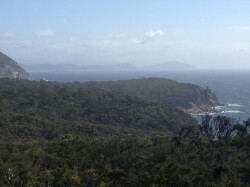 Today we drove to Cape Tourville, which is within the National Park and we walked to the lighthouse, where again, the scenery was breathtaking. 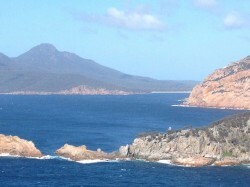 Looking south, you can see Wineglass Bay and the start of the mountain range running down the national park, as well as the impressive Southern Ocean. We had lunch at Honeymoon Bay, sharing a table with a delightful young couple and their 2 year old son. We had our eye on their lunch, consisting of gyozas, fried rice and fruit. We sufficed with a pastrami and salad roll. The actual day-use area looked as if a very strong wind storm had come through, with loads of fallen trees. The national park rangers could put in more tables to cope with the number of tourists.